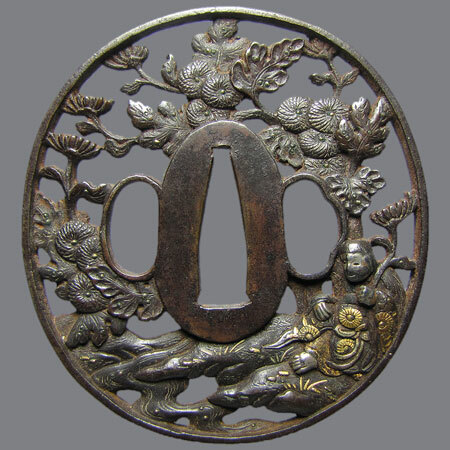 Iron tsuba made in classical style of the Soten school. 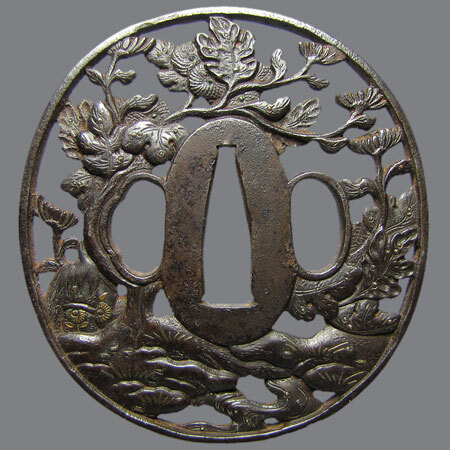 The design is the legend about the Kiku Jido. he was a favourite attendant of Emperor Mu, until one day he accidentally stepped over the imperial pillow. As a result of the machinations of a rival he was banished to the mountains. At the time of parting Emperor Mu took pity of him and taught Kiku Jidou a line from The Lotus Sutra in order to ensure his safety. 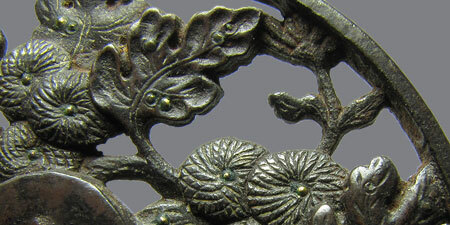 Kikujidou exiled to a valley of blooming chrysanthemums, spent his days writing this Buddhist saying on chrysanthemum leaves. When he immersed these leaves into the valley stream, the stream water turned into an elixir of immortality. 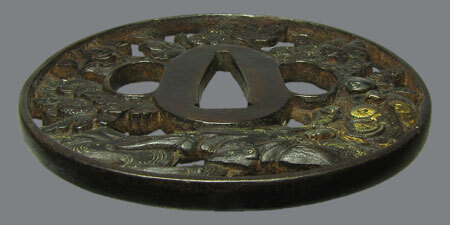 Iron, niku bori ji sukashi, zogan with silver, gold and brass. Nagamaru gata, kaku mimi; 7,6 х 7,1 x 0,5 cm.